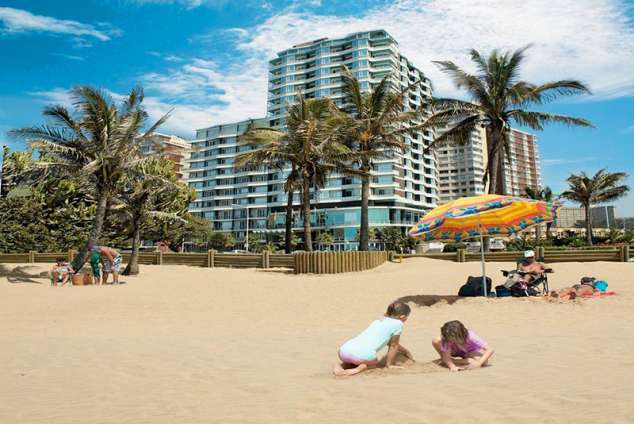 Blue Waters Hotel - Durban Beachfront Accommodation. You might relax in the Coimbra Cocktail Bar overlooking the pool before enjoying a sumptuous buffet or a la Carte lunch or dinner in the elegant Versailles Restaurant. The Florida Lounge, where you can enjoy tea, scones, and quiet conversation, boasts magnificent panoramic views of the Indian Ocean. Enjoy light refreshments whilst looking over Durban's Golden Mile. A 24 hour bar service is available. The Blue Waters Hotel has 264 single and double rooms, 14 luxury suites, all with a private, sea-facing balcony and en suite bathrooms. Facilities include air-conditioning, telephone and voicemail, hairdryer and beverage maker. The Hotel has 10 beautifully appointed function rooms for cocktail parties, seated banquets for up to 250 guests and weddings, our speciality, meetings, seminars, conferences and trade shows. Secretarial services are available. Other general facilities include secure parking, room service, valet service, hairdressing salon, swimming pool, squash court, sauna and sundeck. 293337 page views since 07 Jan, 1999. Last updated on 26 Jun, 2018.